Based on the novel written by Darcey Bell, the movie focuses on Stephanie, a young mother and also a vlogger in her spare time who lives in a small town, the same place where her best friend lives. But one day, her best friend, Emily, disappears abruptly and Stephanie will try to uncover the truth behind this mystery. Sooner, she receives a chilling and disturbing message. Paul Feig ('Ghostbuster') directs this thriller starring Anna Kendrick ('Pitch Perfect', 'The Twilight Saga'), Blake Lively ('The Age of Adaline', 'Green Lantern'), Jean Smart ('Legion'), Rupert Friend ('Queen Victoria'), Eric Johnson ('Fifty Shades Darker' and 'Fifty Shades Freed') and Linda Cardellini ('Avengers: Age of Ultron'), among others. Write your own 'A Simple Favor' review. The gin used to make the Martinis Anna Kendrick and Blake Lively shared on the film is, in fact, Aviation Gin, the company of Ryan Reynolds, Lively's husband. 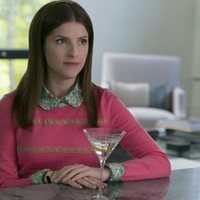 'A Simple Favor' is the second non-comedy film based on a novel directed by Paul Feig since 'I Am David'. Many differences appear from the film's source novel: In the novel, Sean works on Wall Street, while in the film, he's an English professor; Emily and Sean are wealthy; Stephanie is a blogger as opposed to a vlogger.